Compact true-rms meter for HVAC (heating ventilation air conditioning) troubleshooting. 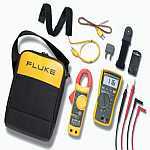 The Fluke 116 was specifically designed for the HVAC professional. It has everything needed in an HVAC meter including temperature and microamp measurements to quickly troubleshoot problems with HVAC equipment and flame sensors.